A panel of judges will select the first, second, and third-place winners in the contest. 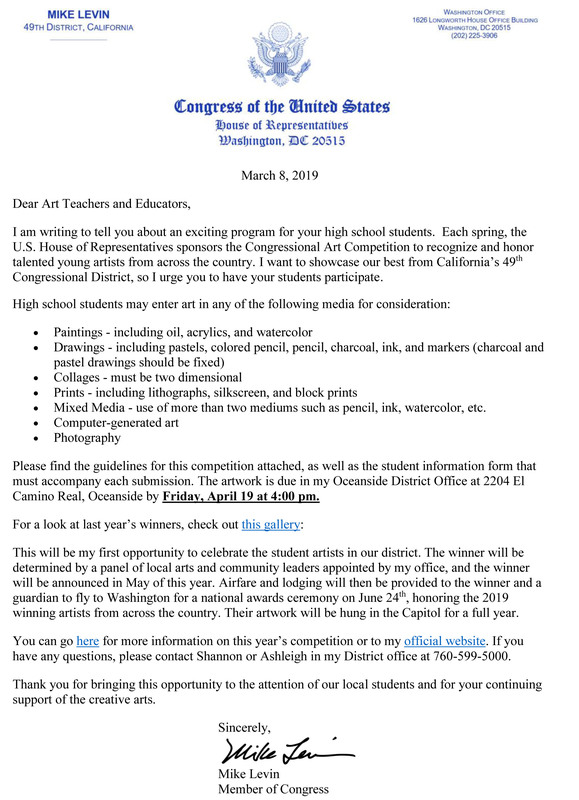 The first-place winner will receive $500 and two roundtrip tickets to Washington D.C. to attend a reception on June 24th for the top high school artists from Congressional Districts around the country. It is assumed, but not required, that our winner will use the cash prize to cover lodging during their stay in Washington. The second-place winner will receive $100; the third-place winner, $50. This is our first opportunity to host this competition, so we’re figuring this out as we go. Please feel free to contact my colleague Shannon Bradley, who is spearheading this project, at Shannon.Bradley@mail.house.gov if you have questions.